The Royal Navy ace returns to the cage when he faces David Khalsa in the main event of Battle Arena 54 tomorrow. 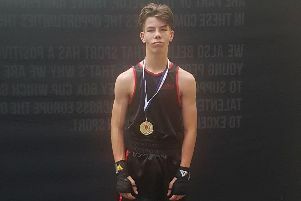 Hardy, who trains out of Fratton’s Gym 01, is forging himself a reputation as one of the best bantamweights in the country. 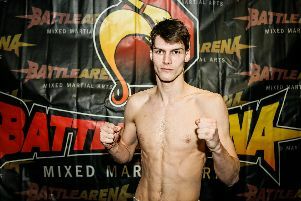 Boasting a 5-1 record and unbeaten since his professional debut, the Darlington-born talent held talks to fight on American giants Bellator’s card in Newcastle last month. Nothing materialised, although Hardy has refused to get downbeat about it. His full focus is on Khalsa when they meet at Edgbaston before he fights for the Made4TheCage 135lbs title on April 6. Winning at least one belt this year is Hardy’s primary aim. But first he must get past the dangerous Khalsa, who he’s not underestimating. ‘There’s a really good vibe in the gym at the moment because everyone is keen to learn. ‘Everyone has got fights coming up and there are a lot of serious heads. ‘To be honest, Bellator is at the back of my mind at the moment. I’ve got a couple of fights lined up so I’m just focusing on them. ‘There’s no point getting myself down about it and I’m just focusing on my upcoming fight, so I’ve got a lot to look forward to. ‘At the very least I want to win one belt this year. It’s been one of my goals since I started fighting, whether it be amateur or professional. ‘But I can’t overlook David Khalsa. He’s had all of his pro fights on BAMMA so it’s a good standard he’s contested at. ‘The thing with Khalsa is his record doesn’t match his ability because all of his fights have been against a good calibre of opponents – you can’t knock him. Coming from a stand-up background, the wrestling and jiu-jitsu side of things was where Hardy had to acclimatise. Under the tutelage of the coaches at Gym 01, he now feels more than comfortable on the mat. He underlined his improving repertoire in his past two victories over Jean Do Duc and Olya Wolfe, respectively. ‘I like to show I’m a good MMA fighter,’ added Hardy. ‘The past couple of fights have shown that I’m not just going out there to strike and I can wrestle and take it to the ground. ‘I’m not afraid where any fight goes now, no matter who it’s against.